ROUND ROCK, Texas - Take a bow, Hanser! 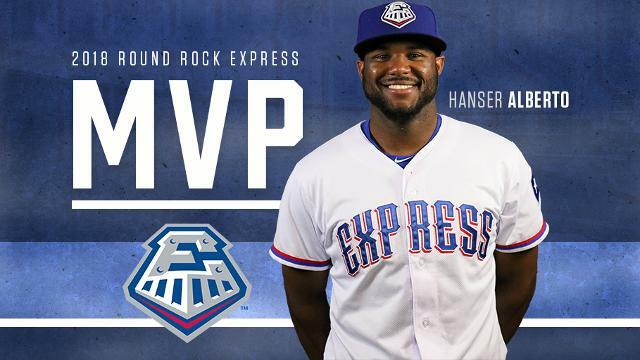 The Round Rock Express announced on Wednesday afternoon that INF Hanser Alberto has been named the team's Most Valuable Player for the 2018 season. Alberto takes home the honors after a record-setting campaign in his fourth year with the team. The 25-year-old led the Express with a .330 (119-361) batting average, a mark that ranked third in the Pacific Coast League and set a new single-season Round Rock franchise record for hitters with at least 300 at-bats. He also posted the lowest total plate appearances-to-strikeouts in the league after striking out just 28 times in 384 total plate appearances. In 101 total games with the club, Alberto appeared in 44 games at shortstop, 43 at first base, nine at second base, three at third base and two in the outfield. The San Francisco de Macoris, Dominican Republic-native also ranked second on the club with 58 RBI, second only behind fellow INF Tommy Joseph's 67. After missing nearly the entire 2017 campaign, Alberto began the year with Round Rock and served as the team's Opening Day shortstop. The Texas Rangers selected Alberto's contract on May 15, where he returned to the bigs for the first time since 2016. Alberto posted a pair of stints with the Rangers, May 15-June 2 and June 4-10, before being recalled on August 24. He is currently on the team's active roster. In 247 career games with the Express since 2015, Alberto is hitting .309 (292-945) with 49 doubles, eight triples, 19 homers and 128 RBI. He was originally signed by the Rangers as a non-drafted free agent on November 23, 2009.